Battling postpartum depression? You are not alone. Since the birth of her child, actress Hayden Panettiere has been open about her battle with postpartum depression, including checking into a treatment center for help. Yvette R. Johnson, M.D., MPH, is medical director of Cook Children’s NEST Developmental Follow-Up Center, which provides support, planning and care coordination for high-risk NICU babies. "Although the focus of the NEST clinic is to evaluate the developmental outcomes of high risk graduates of the NICU, we recognize the mental health of the family and mother are also critical factors in the growth and development of these infants," said Dr. Johnson, who has researched the impact of postpartum depression children. Social workers and parent peers are available for moms who are at Cook Children’s NICU, following the birth of their child. The NEST clinic plans to add a service to its current interventions that will include screening for postpartum depression, and assisting families to access mental health resources in the community. Postpartum depression is likely more common than you think. If you are experiencing these symptoms, you are not alone. For your own safety and the safety of your baby, don’t be afraid to ask for help. Your doctor or your baby’s pediatrician will have resources that can help. Yvette R. Johnson, M.D., MPH, is the medical director of Cook Children's new NEST Developmental Follow-up Center. 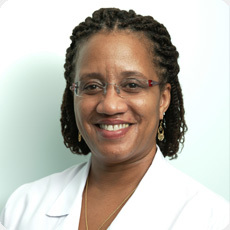 Dr. Johnson is a neonatologist with an interest in the area of neonatal developmental outcomes She earned her medical degree from Washington University School of Medicine, and continued with her residency at Saint Louis Children's Hospital and fellowships at Saint Louis Children's Hospital and Johns Hopkins Bloomberg School of Public Health. She is board certified in neonatal-perinatal medicine.